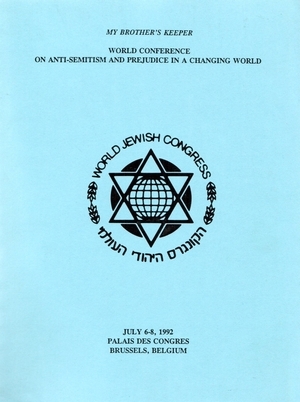 Brussels: World Jewish Congress, Jonathan R. Cohen, ed., July 6-8, 1992. There are two broadly different ways of understanding anti-Semitism in the Muslim world. One holds it as longstanding, that it is a permanent part of the religion. The second sees it as an importation from Christianity, from Europe. The first view I associate with Ronald Nettler, a writer on the subject. He argues that the Muslim doctrine on Jews has been and is very negative. Go back to the Qur'an and other sources of Islamic religious inspiration, and find that the majority of references to Jews are negative in the extreme. He also notes that these comments are more negative than the actual treatment of Jews, that there was a tension between the more tolerable circumstances of Jewish life and the less tolerant words in the religious doctrine. This goes back right to the very beginning of the religion. There are some parallels between the Christian and the Muslim difficulties with Jews. Mohammed, the prophet, clashed with Jews in his lifetime and this led to a sense of Jews being the great enemy of Islam. But in contrast to Christianity, Islam had no obsession with Jews; there is no time in the last millennium when Jews had a role nearly so great as they had in Christianity. It was not an obsession but a cool and casual disdain. Jews were seen as vestiges of an earlier religion, of an imperfect religion, as people without strength, without potential, as people of no great interest. Jews were tolerated in general if they accepted their inferior place within the Muslim world. However, if Jews had pretensions to power, then this was found to be outrageous and unacceptable. The implication of this first view, then, is that anti-Semitism runs deep in Islam and it resonates in the culture. The second view, which I associate with Bernard Lewis, holds that anti-Semitism is essentially an import from Europe; that Islam lacks the Christian tradition of exaggerating Jewish power, and that, just because it results from disdain rather than fear, Jews have had no particular importance in Islam The modern obsession with Jews in the Muslim world is a recent phenomenon that derives from Europe. Just as the Muslims learned about forks and knives and airplanes and modern medicine from Europe, so they received their notions of the Jew from Europe. This school of thought notes that the image of the usurious Jew, the blood libel, the notion of a separate Jewish race, of a Jewish conspiracy to dominate the world - all these clearly derive from European sources. The implication of this second view, then, is that anti-Semitism is relatively superficial. It is a tool, an instrument to be used against Israel or other Jews. It arose as part of the Arab-Israeli conflict, specifically with Gamal Abdul Nasser in Egypt in the 1950s, and it will last only so long as it is useful. Which of these is correct? Both, but perhaps the second more so. It gets to the heart of the matter. The phenomenon is more imported than indigenous. And I am somewhat optimistic about the possibility of change, recognizing that the last generation or two have been surrounded by anti-Semitic themes and that some of these will stick. For in contrast with Western anti-Semitism, what one finds in the Muslim world is impersonal. Few Muslims have contact with Jews, and what is emphasized is the conspiratorial dimension, the larger, the theoretical, abstract political dimension rather than personal animus. There are some important positive and negative trends. On the positive side, some of the main sources of anti-Semitism are quiet. With the collapse of the Soviet Union, the vast propaganda machinery of hatred coming out of Moscow has been silenced. And more than that, there is no more pressure on the Muslim countries to adopt the Soviet line. In addition, there are troubles in the oil patch; the Libyans, the Iranians, the Saudis lack the means that they had in the 1970s, and also more recently, to spew hatred of Jews around the world. Desert Storm and the American pre-eminence of the last couple of years have also been important. Governments are cutting back on spreading anti-Semitism - and by the way, anti-Semitism very commonly includes anti-Americanism. The Kuwaitis and the Saudis in particular have refrained from this propaganda. Peace talks are currently under way with no fewer than eleven countries across the table from Israel. So at the state level, there are significant changes in a positive direction. At the same time, the negative developments are strong too. These are not at the state level; these are more cultural. They have more to do with the process that I mentioned before, of anti-Semitism becoming endemic. Conspiracism about Jews, notions of Jews trying to take over the world, are becoming ever more widely heard. So, in brief, I would argue that while anti-Semitism is losing ground at the top, at the level of states, it is gaining at the popular level, at the level of culture, groups, small organizations. I shall deal with two topics: the implications of Muslim anti-Semitism for Israel and for world Jewry. For Israel, it's a mixed picture. The fact that the Muslim states are less involved means that the Arab state leaders are more amenable to resolution of the Arab-Israel conflict. At the same time however, the groups, the individuals, the cultural elements, are more negative, and that means in effect that the Palestinians are becoming ever more anti-Semitic, so that the PLO which was deeply anti-Zionist and had certainly its strain of anti-Semitism but did not engage in it officially is being somewhat pushed aside by Hamas, the fundamentalist Muslim Palestinian movement which is overtly anti-Semitic and overtly, in its charter, refers to the Protocols of the Elders of Zion. I am by no means saying the PLO is good in this regard, but it is far more restrained than Hamas. So there is a paradox: again, at the state level, anti-Semitism is receding, while at the level of individuals, at the level of Palestinians, it is increasing. To me this points to the increased possibility of Israel making a deal at the state level while having to tough it out and endure the attitudes, the wishes, the dreams, of the Palestinians. For world Jewry, Muslim anti-Semitism is an increasing problem, and in large part this has to do with the ever-growing population of Muslims in the West. There are nearly four million Muslims in France; some two million in Germany; one and a half million in the United Kingdom and in the United States; almost a million in Italy; and something on the order of half a million in Belgium. The Muslims who emigrate or convert and live in the West are not that different from the Muslims in the rest of the Muslim world and the home countries. They have their share of secularists and fundamentalists but fundamentalists, the most anti-Semitic of Muslims, are disproportionately powerful in the West. That's due in part to they're being organized, in part to the secular Muslims going on to do other things and not sticking within the community of Muslims, and in part to support from the Middle East going almost invariably to fundamentalists. The Iranians, the Libyans, the Saudis have now for years been supporting the most aggressive, radical fundamentalist groups and, by definition, these are also anti-Semitic groups. These fundamentalists are forwarding anti-Semitism in a variety of ways. A man by the name of Ahmed Arami broadcast excerpts from Hitler's Mein Kampf on something called Radio Islam in Sweden, and as a result he spent six months in a Swedish jail. In the United States, Louis Farrakhan has referred to Judaism as a gutter religion. These are extreme cases to be sure, but these are the people who are speaking in terms of overt anti-Semitism not found elsewhere in the West. These are people who pose a potentially serious threat to Jewish welfare. Their numbers are growing, and fundamentalists continue to dominate the discourse. My message then is that ultimately anti-Semitism is more serious in the West than in the Middle East. The Christian world has a resonance to anti-Semitism not found in the Muslim world; fundamentalist Muslims today are the most vibrant and explicit anti-Semites; they are contributing to and who are increasing anti-Semitism in the West.